No Pumpkins…But Lots of BEANS!!! For those of you who’ve been reading for awhile, you know that we have, for years, had a family pumpkin growing contest. Now that we’re settled in Florida, and have a new garden, we have been very busy planting, watering, and watching the fruits of our efforts end up on our dinner plates. Unfortunately, it doesn’t appear pumpkins are very fond of Florida summers. They all died. So did the green beans and sugar snap peas. I might try replanting them later in the summer. The good news is we have tomatoes (three kinds), peppers, figs, carrots, onions, leeks, cucumbers, and many other goodies that are doing just great. 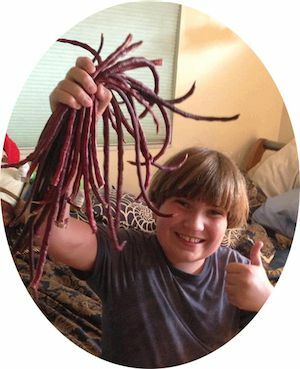 The one plant that is outgrowing everything else, however, is the Chinese Red Noodle Bean. Those plants are Max’s and, holy cow, we can’t pick those beans fast enough! The best part of all? The beans are HUGE! One bean can be one individual’s entire veggie serving at dinner. “Why does Toys R Us have a backwards R?